"When the moment comes, so then shall I see the solution". I stammered as I spoke and I am sure it didn't come across as very convincing as Yoda teaching Luke on the Da-goby system. In fact, given this is the second time I have touched on his question, I think he got me worrying! After the Spoke Incident and making my repairs, I was able to cruise somewhat smoothly into Hamburg. Yet I could sense a host of other problems brewing. Sure enough making a 500 metre jaunt in Claudia's neighbourhood the next day, everything disintegrated! My gears stopped shifting, another spoke broke, my bag hook system busted, and my back tube needed replacing! Its a minor miracle that they all held out until Claudia's. After visiting Claudia's Church on Sunday, I met Arno and his wife over coffee. We hit if off immediately. I mentioned, that I needed to repair my bike that day. Arno enthusiastically offered to look at it with me in his cellar. I headed on over that afternoon. Get this Wout... it turns out that Arno is a retired German mechanical engineer and cycle enthusiast! 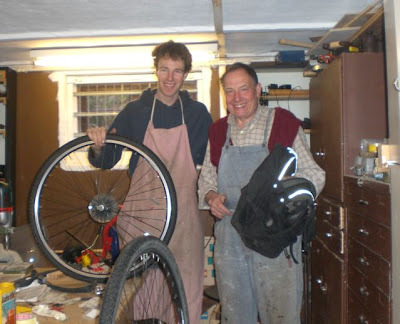 We had to pick our way around the collection of bikes in his basement to get to his tool bench. He had all the tools I could dream of, not to mention a vast repository of parts! We tackled one problem after another. "Behoven". That means 'fixed' in German. But it wasn't just about fixing a bike. My bike problems weren't really a problem. They were the means for an extradorniary connection. Problems and material things are all kinda that way aren't they? They are just props in this extradonary web of connections, encounters and relationships that we call life. Arno and his wife had lost their son twelve years ago. He died after returning from backbacking in my province of British Columbia. He had traveled through towns and places that I know well. There was picture of their son on the living room table. He was my age. He and I looked so much a like it was chilling. An outer enthusiast, he even wore an Icelandic sweater just like mine. I realized that there was much more to Arno's good will to help me with my bike. Arno and Renalta dearly miss their son. The universe was giving him something him intangibly meaningful by me being there to be helped. Apparently their son had had a profound experience in BC before he died and had been shown much kindness by Canadians. My bike is fixed. It hasn't run smoother in months. Arno accompanied me to the outskirts of Hamburg on his bike. There, sheltering from the rain under a bridge, I thanked him for all his help. But they were just words. What was really said was spoken with our embrace. I've said many goodbyes on my journey. Just about as many times as I have said hello. However, this was one of the most emotional. Was it just the rain, or did we embrace with a tears in both our eyes? As I pedaled off, he watched me cycle down the road and away into the unknown. It certainly wasn't just the rain. People Everywhere are People. And they're Good.